Michael Sweet has a story to tell and is finally ready to share it. Although he’s been incredibly active singing for Stryper and even took a stint co-fronting Boston, Sweet’s been flying under the solo radar as of late. But that’s all about to change. 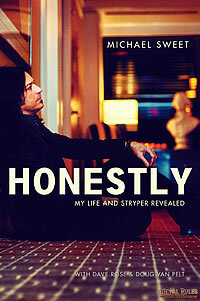 With a new book release this spring, Honestly: My Life & Stryper Revealed, Michael is finally telling the backstory of his years as the front man for one of rock and roll’s legendary hard-rock bands. Accompanying the book is Sweet’s first full-length original album since 2000. I’m Not Your Suicide shows off the harder edge that Stryper fans know so well, along with a softer side and a crazy guest list. Amidst the frenzy of the book and album release (both on BIG3 Records), Sweet was able to squeeze CCM into his schedule. Read on to find out more about the 10 million album-seller’s current whereabouts and a look at his all-star musical collaborators and the book’s overarching message. CCM: What’s the story behind the new album’s title, I’m Not Your Suicide? MICHAEL SWEET: It was written and completed more than two years ago. It’s a compilation of my heart and soul, good and bad; and it’s very diverse, musically speaking. The title track was co-written by Blair Daly and holds a strong message of hope to those who have been beaten down and who have considered suicide. CCM: You’ve obviously been very active with Stryper, but this is technically your first solo album of entirely original material since 2000. Did you intend the break to last that long or were you simply waiting for specific inspiration? MICHAEL: Sometimes in this crazy business you don’t always have the option of doing things according to your own schedule or time-frame. I had to wait, but I’m glad I did. It made me dig deeper. CCM: Musically, where does this album land compared to your past projects? MICHAEL: It’s similar to my previous all-original solo release, Truth. It’s got an edge, yet it has a soft side too. I love to experiment, and I certainly did on this project. I used steel guitar, 12-string, mellotron, Moog, Ebow, slide guitar, Rhodes and lots of cool instruments on this album. CCM: What was your favorite part about each of the key collaborations? MICHAEL: Just being able to work with some of these guys — Kevin Max, Tony Harnell, Chris Jericho, Doug Aldrich, Electra Mustaine and, of course, Robert Sweet and Timothy Gaines. They are highly respected by me and the rest of the world. CCM: How does the CD tie in with your highly anticipated autobiography? MICHAEL: It speaks openly and honestly, as does the book. They both have a deep and powerful message. CCM: What message do you hope fans will take away from all of this? MICHAEL: To see that I’m just a man who makes mistakes; but through Christ, I’m lifted up and given the strength to carry on. I hope and pray that someone will be touched in a positive way and be helped by something that I’ve personally experienced.